Wednesday, January 23, 2019 - On Tuesday, January 22, 2019 the Coweta Substance Abuse Prevention (C-SAP) and the Newnan Police Department hosted a ribbon cutting ceremony. This was for a prescription drug drop-box unveil at the police department. The box was donated by CVS Pharmacy's Medication Disposal for the Safer Communities program. This will provide Coweta County residents a way to safely and legally dispose of medications. The Coweta community, coalition members and city council were invited to the ceremony. There are now two prescription drug drop-boxes in Coweta County. "There is an additional drug drop-box located at the [Coweta County] Sherriff's Office," said Mel Kendricks, C-SAP Outreach Coordinator. Kendricks and City of Newnan Chief of Police, D.L. "Buster" Meadows welcomed and introduced City of Newnan Mayor Keith Brady, Cleatus Phillips, City Manager, city council members Ray DuBose and Paul Guillaume, and District Attorney, Herb Cranford. "If someone in your family is using illegal drugs have them drop them in the box," Chief Meadows said, "It's a sign they need help." John Bringuel, a C-SAP collaborative member, is the Project Director for the Georgia Prescription Drug Abuse Prevention Initiative was present and made a few statements. Bringuel had an integral part in securing the drop-box for the Newnan Police Department. Kendricks also thanked Mark Whitlock, CEO of the Central Education Center (CEC), and Laura Horton, Video Producer at WOW! Internet, Cable and Phone for their cooperation with video footage. The Department of Behavorial Health and Development Disabilities discovered Coweta County is ranked 6th out of 159 counties for opioid misuse and abuse in Georgia. 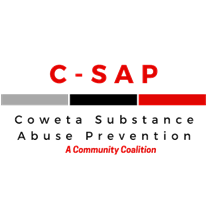 The Coweta Substance Abuse Prevention, A Community Coalition (C-SAP), has over 50 active, dedicated members, and an Advisory Council consisting of community leaders, business partners, and stakeholders. Our vision is to raise community awareness about the misuse and abuse of prescription drugs. Our goal is to reduce the misuse and abuse through the implementation of prevention strategies.